Peter works as the Threatened Plant Scientist for the Ecosystems and Species Unit of Research & Development, National Office, Department of Conservation. 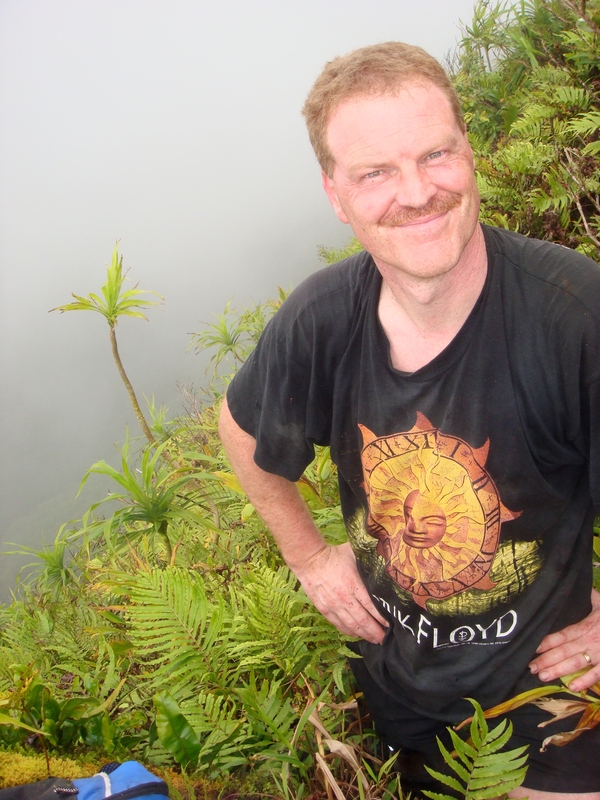 Based in Auckland since 1993, Peter works on a variety of subjects including plant biosystematics, cytology, ethnobotany, threatened plant management, and threat classification systems. A Fellow of the London based Linnean Society (FLS) Peter intially studied at the University of Waikato from where he obtained his B.Sc. in biological and earth sciences, and then M.Sc. (Hons) in palaeoecology and tephrochronostratigraphy, before completing a PhD at the University of Auckland in plant biosystematics. Author of 14 books and 120 scientific papers he has a particular interest in the conservation and documentation of island floras, and has worked on such island groups as Norfolk, the Cook Islands (Rarotonga), the Chatham Islands (for which he is writing a vascular flora) and many of the smaller offshore islands of northern New Zealand. During the May 2011 visit I am hoping to expand current knowledge of the bryophyte, lichen and algal floras of the Southern Kermadec Islands group, as well as try to obtain for the New Zealand Seed Bank material of the threatened L’Esperance Rock groundsel (Senecio lautus subsp. esperensis), and determine whether the 2006 attempted rodent eradication on Macauley Island was successful. In 2009 I made my first visit to the Kermadec Islands where I was tasked with documenting the bryophyte flora of Raoul Island. During my time on Raoul I made significant advances in our knowledge of that islands hornwort, liverwort and moss flora as well as discovering a number of plants new to the New Zealand Botanical Region. With this expedition I have the opportunity to document more information on flora of the Kermadecs, ultimately contributing to its conservation. When back in New Zealand I tend to work from home writing research papers and dealing with plant management issues (often providing science advice), the University of Auckland where I am a Research Associate and so undertake lectures, supervise research students and conduct my own research, and the Museum of Auckland where I have lodged over 14,000 plant specimens and whose resources I use to further my taxonomic research.